This Korean online clothing retailer took a simplistic approach to their branded gift bags, opting for minimalism to convey a message of practicality. The plain white paper bag is paired with a black Petersham ribbon handle, and the brand name is printed onto both outer side panels for instant brand recognition. This simple paper bag design is sprinkled with creativity by using a vibrant blue for the inside panels, making it easy on the eyes and the type of branded paper bag you’ll be reluctant to throw away. Nothing gets noticed as quickly as bright red. This gift bag is begging to be looked at, with red outer panels and equally vibrant red soft cord handles. The brand name has been printed with silver foiling for an understated touch of luxury. 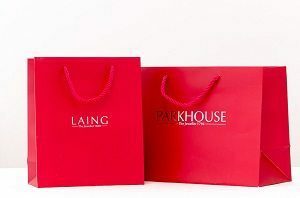 If you’re noticing the paper bag, you’re noticing the branding on it, which is exactly the effect Parkhouse by Laing were looking to achieve with this branded gift bag. 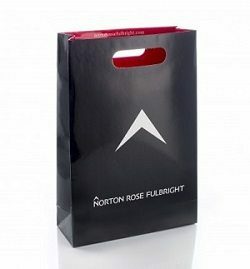 This stunning branded paper bag from highly successful London law firm, Norton Rose Fulbright, incorporates everything a branded gift bag should feature. A simple matt black exterior allows the brand name and symbol to pop without having to incorporate foiling or embossing. The interior panels are coloured red for a stark contrast against the black exterior, and a cut-out handle is used for practicality. On the whole, a stunning branded paper bag that most would keep for another occasion. 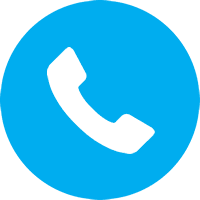 For bulk paper bags in South Africa and the United Kingdom, get in touch with Kikibag right here! Our paper bags are made from renewable paper sources in KwaZulu-Natal, and are completely biodegradable. 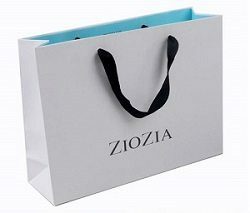 Our paper bag printing options include foiling and embossing, and you can choose from three different handle options. For bulk branded gift bags, choose the bag people – choose Kikibag.